A SpaceX Falcon 9 rocket provided a spectacular show to morning commuters across Southern California on Thursday after taking off from Vandenberg Air Force Base with Spain’s PAZ radar satellite and a pair of SpaceX prototype broadband satellites. Falcon 9 streaked into the morning sun as it climbed skyward while observers on the ground remained in the dark and were stunned by the expanding clouds of gas emanating from the rocket and the various components it shed on its way into orbit. 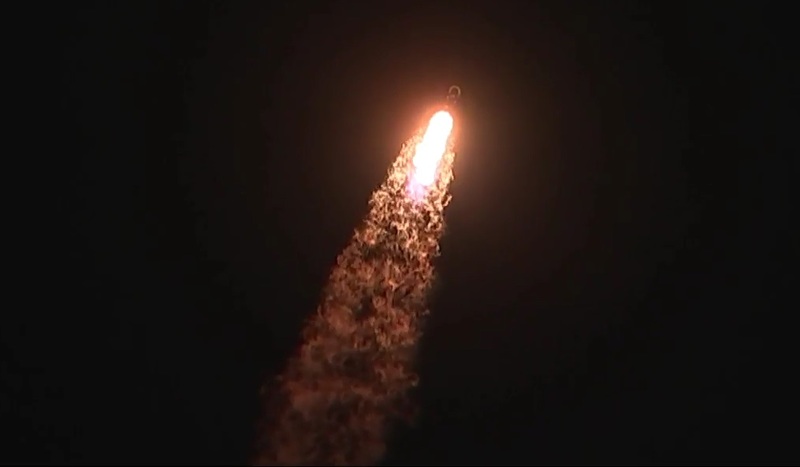 Thursday’s launch marked SpaceX’s fourth mission of the year and the 20th orbital space launch of 2018, involving a re-used Falcon 9 first stage from a 2017 VAFB mission and debuting SpaceX’s “Payload Fairing 2.0” designed for operational recovery and re-flight missions as the company continues its push toward making more and more elements of their launch system re-usable to slash costs for accessing space. 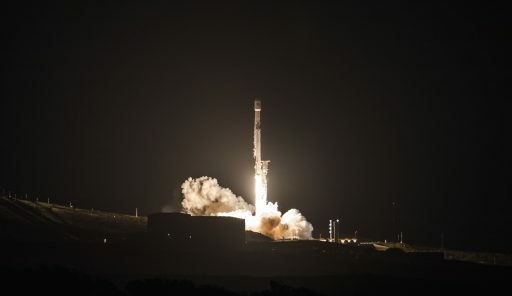 Blasting off from SLC-4E at Vandenberg at 14:17 UTC, 6:17 a.m. local time, the 70-meter tall Falcon 9 fired its first stage for the first two and a half minutes of the mission before the MVac-powered second stage took over for a direct boost into a 514-Kilometer Sun Synchronous Orbit. The twice-used Booster was not planned to be recovered and, like a number of recent expendable missions, went through a series of flight tests after separation before finding a watery grave in the Pacific Ocean. These post-separation maneuvers contributed to be powerful display painted into the outer atmosphere by Falcon 9 and visible across most of California. The launch of PAZ, coming after years of delays and a launch vehicle switch, was initially expected on Saturday but slipped into this week as SpaceX took additional time to review what it called “an upgraded payload fairing.” Sources have since confirmed that this indeed referred to the long-awaited “Fairing 2.0” that SpaceX hopes will lead to considerable progress in the area of fairing re-use by the end of the year. Installed atop the rocket’s second stage, the Payload Fairing is tasked with protecting the vehicle’s payload while out in the elements waiting for launch and during the extreme aerodynamic environments encountered during atmospheric ascent. Falcon 9 flies with one of the largest payload fairings currently in operation under a “one size fits all” architecture as opposed to other launchers that can use differently sized fairings to accommodate payloads of various sizes. The 13-meter long, 5.2-meter diameter payload fairing maintains the rocket’s aerodynamic profile while flying through the dense atmospheric layers before splitting open and separating in two halves roughly three to four minutes into the mission when its protection is no-longer needed in order to discard unnecessary weight. 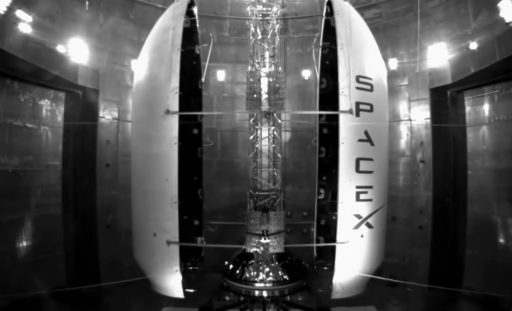 SpaceX earmarked the fairing as a desired re-use item early on because of two major factors: a) its cost being around 10% of the total cost for a Falcon 9 and b) its all-composite construction being a time-intensive process creating a potential bottleneck in the company’s plans for a rapid mission cadence. The step-up to Fairing 2.0 was incremental with several of the previous generation fairings introducing some of the recovery systems with all eventually coming together in the upgraded fairing design that consists of fewer parts, is lighter in mass and allows for faster manufacture. From an external appearance, Fairing 2.0 seems to be slightly larger than its predecessor, growing around 0.1 meter in diameter and length based on imagery of the PAZ vehicle, but what differentiates it from the baseline Falcon fairing resides on the inside and at the fairing base in the form of an upgraded structural interface. Each fairing half has its own avionics system, pressure vessels holding Nitrogen gas, a manifold of lines transporting propellant to a series of cold gas thrusters and a compartment for an auto-steering parachute. One particular area improved on Fairing 2.0 was the chute attachment since the baseline fairing introduced a turbulent airflow that made the chutes only partially effective, resulting in trouble on the way back to Earth, especially in the accuracy department. As the fairings separate from the ascending rocket, they are to employ their thrusters to stabilize from their initial tumble and enter a pre-determined orientation for atmospheric re-entry. The auto-steering chute will then be tasked with guiding each fairing half toward a recovery boat positioned to ‘catch’ it. A vessel going by the name of “Mr. Steven” made a first appearance last year, featuring a four-armed contraption to support the fairing recovery, described by Musk as a “giant catcher’s mitt.” Recent photos of Mr. Steven have shown a net was added in between the four metal arms and the ship departed the Port of Los Angeles before noon on Tuesday to be ready to catch a fairing half. The launch of PAZ and the two MicroSats was handled by the first “Sooty” Falcon 9 booster to launch from the West Coast, having flown back in August 2017 with the FormoSat-5 satellite for Taiwan. Still sporting the sooty attire from its first voyage to space, Booster 1038 was only outfitted with grid fins on Thursday to enable some post-separation flight testing toward a splashdown in the Pacific Ocean as a means of disposal since the Block 3 booster was not deemed suitable for anything beyond two missions. B1038 was the final Block 3 booster to roll off SpaceX’s production line and may very well be the last Block 3 vehicle to fly. Following last-year’s debut of the slightly improved Block 4, SpaceX now plans to roll out the Falcon 9 Block 5 – the final iteration of the workhorse launcher – in April for a Geotransfer Mission out of Cape Canaveral. 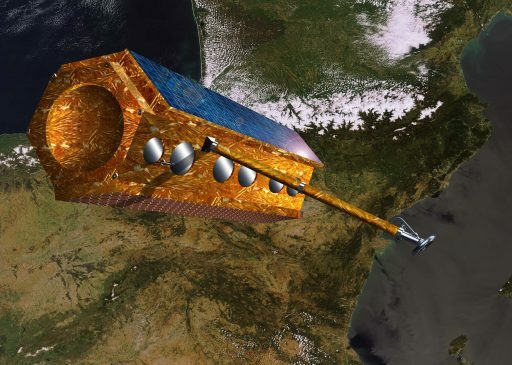 The primary passenger for Thursday’s mission was PAZ, an X-Band Synthetic Aperture Radar Satellite commissioned by Hisdesat and the Spanish Government for multi-mission use in the defence and security sectors, for Earth observation and commercial exploitation of high-quality radar imagery at a ground resolution exceeding one meter. PAZ, Spanish for ‘peace,’ is the first member in the country’s Program for Earth Observation by Satellite (PNOTS) that is to include PAZ as radar component and the upcoming Ingenio optical-imaging spacecraft for multi-band imagery collection. Astrium (now operating under Airbus) was awarded the contract for PAZ in 2008 with an initial goal of launching in 2012. 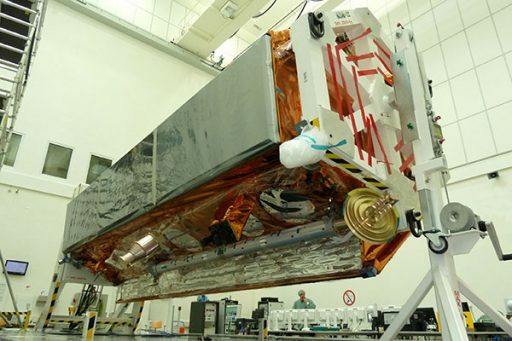 However, the satellite was forced to remain on the ground when its Dnepr rocket fell victim to the conflict between Russia and the Ukraine; eventually prompting Hisdesat to switch launch providers to a 2017 launch slot on SpaceX’s manifest. The 1,350-Kilogram PAZ satellite employs a hexagonal satellite platform with a diameter of 2.4 meters and a length of five meters, hosting a large XSAR antenna on one of its side panels operating at a center frequency of 9.65 GHz and a peak transmit power of 2,260 Watts, capable of operation in various imaging modes including high-resolution spotlight and wide-area ScanSAR to deliver a multitude of data products. Auxiliary payloads include an AIS ship-tracking terminal and GNSS occultation instrument for atmospheric profiling. Among the services provided by the PAZ mission is geo-information intended to enhance surveillance of the Spanish territory and other parts of the globe, improve the security of the Spanish borders, support operations of the Spanish armed forces, provide data for natural disaster assessment and mitigation, and support risk and crisis management. Data from the satellite will also be used to support operations against piracy in the waters off Somalia and to control the illegal traffic of immigrants into and through Spanish waters. PAZ has a planned service life of seven years, but Hisdesat is confident the spacecraft will last for at least ten – in part because of the performance of its predecessors, the German TerraSAR-X and TanDEM-X that have been in operation since 2007 and 2010 and will be set for a coordinated extended mission with PAZ co-located in their orbital plane to maximize coverage. Riding shotgun alongside PAZ were SpaceX’s MicroSat-2a and 2b, the first prototypes from the company’s satellite venture operating out of Redmond, Washington to develop the “Starlink” Internet constellation. The two 400-Kilogram satellites are the first of over 11,000 Starlink satellites to be launched by SpaceX to establish a global Fixed Satellite Services architecture capable of bringing Internet access to all corners of the Earth. 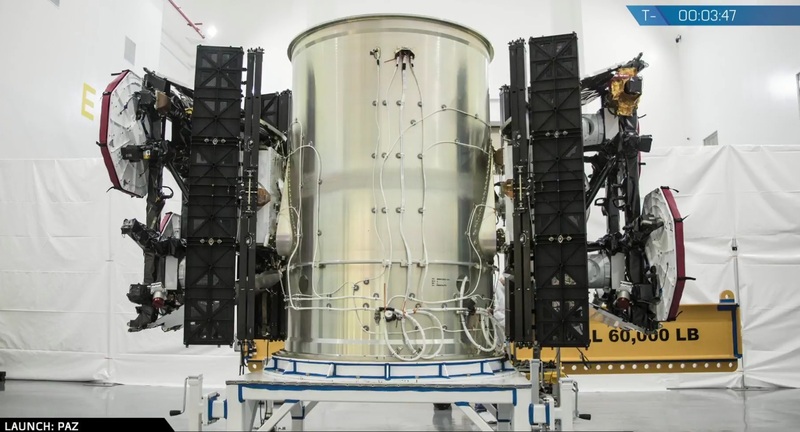 SpaceX announced the Starlink venture in 2015 but has since been extremely tight-lipped about it, only noting that it is still in its development phase. However, filings made with the Federal Communications Commission indicate SpaceX is planning to launch a series of prototypes in 2018 to fully characterize signal and transmission capabilities before pressing into the deployment of the operational constellation as early as next year. According to 2017 documentation, Starlink is to consist of two constellation segments: 4,425 satellites in 83 orbital planes at an altitude of 1,200 Kilometers operating at the Ku/Ka/V-Band frequencies and 7,518 satellites in a Very Low Earth Orbit at 340 Kilometers operating solely in the seldom-used V-Band spectrum. The MicroSat-2a and 2b satellites are identical and only host Ku-Band links to test the data throughput capabilities, pointing of broadband arrays, and ground station handoffs. They will complete one communications demonstration every day for six to 12 months from an orbit of 1,125 Kilometers, according to FCC documentation. 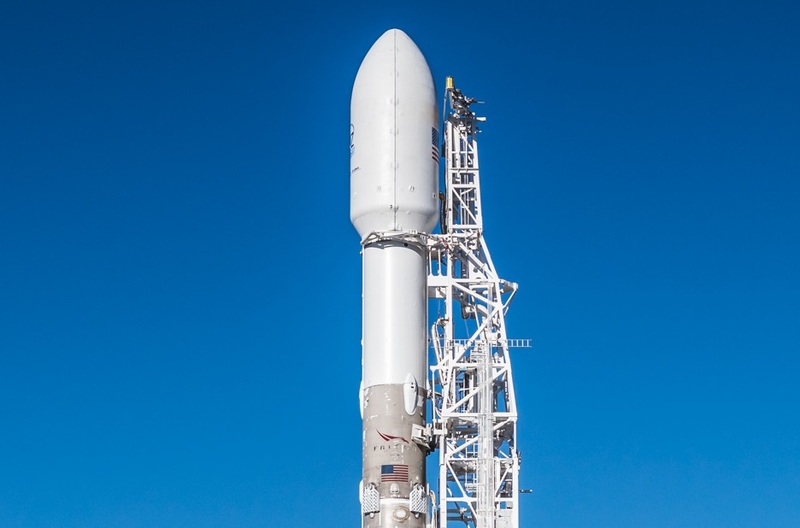 Falcon 9 was wheeled out to the launch pad at SLC-4E on Tuesday with less than 24 hours to go until Wednesday’s instantaneous launch slot. 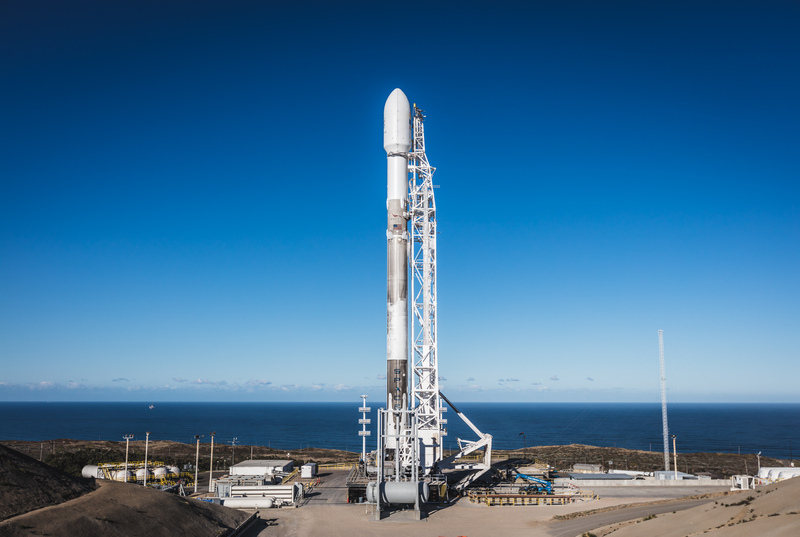 Upper level winds just 1.8% above allowable limits thwarted plans for launching on Wednesday and SpaceX went into a 24-hour recycle. Countdown operations picked up again in the late hours on Wednesday and ran like clockwork as Falcon 9 checked off a series of tests before being handed over to computers to orchestrate the complex tanking sequence picking up at T-70 minutes to load the two-stage rocket with around 155 metric tons of chilled Rocket Propellant 1 and some 360 metric tons of sub-cooled Liquid Oxygen. 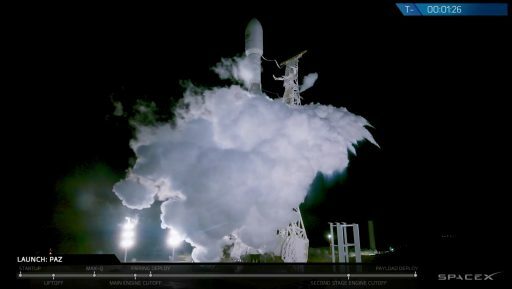 Falcon 9 was venting gaseous oxygen as it headed into the fast-paced events of its final countdown sequence to chill down its nine Merlin 1D engines, switch to battery power, retract the Strongback structure and achieve flight levels on its fuel and oxidizer tanks with close-out of LOX load right at the T-2-minute mark. A final GO was voiced from the Autonomous Flight Termination System as Falcon 9 assumed control at the one-minute mark and the Launch Director gave his final approval with half a minute on the clock. 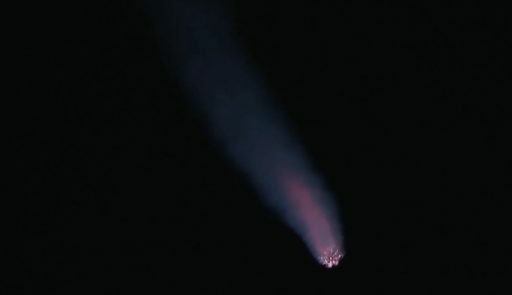 The bright green flash of Falcon’s igniter mix lit up the rocket’s business end at T-3 seconds as all nine engines soared up to a cumulative launch thrust near 700 metric-ton-force under close watch by computers. 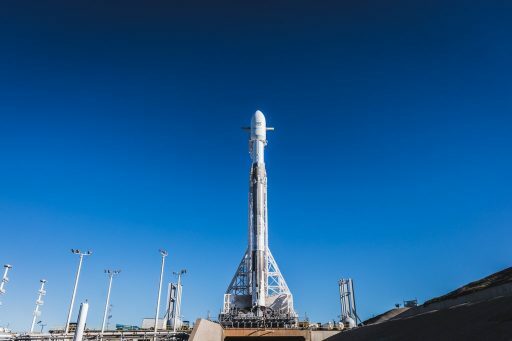 Hold-downs released the rocket at precisely 14:17:00 UTC, right at first light and still 21 minutes before sunrise – creating the right ingredients for another spectacular display in the SoCal skies similar to that of December’s Iridium-4 mission that occurred at evening twilight. 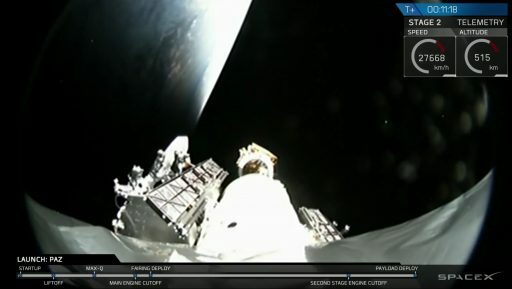 Rising from its launch pad, Falcon 9 climbed vertically before pitching and rolling onto its flight trajectory to the south-south-west, headed toward a 97.44° orbit. 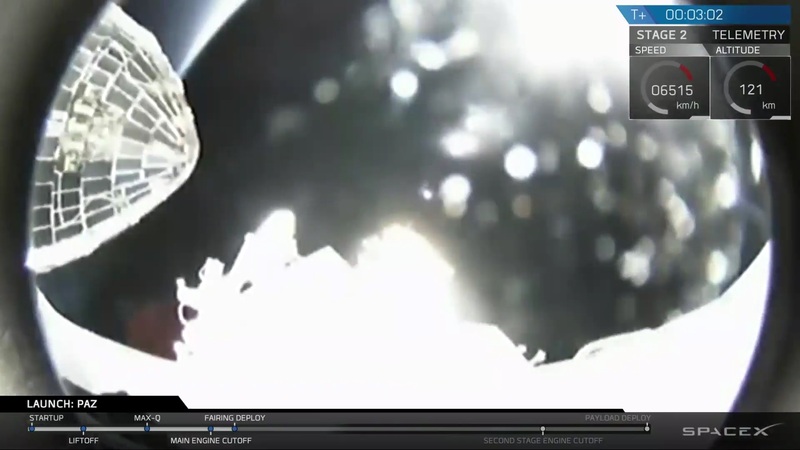 As the vehicle went through the sound barrier, thrust on the nine Merlin engines was reduced for Maximum Dynamic Pressure before Falcon 9 went back into full thrust mode for another minute of first stage flight – ascending into sunlight as it rapidly gained altitude. The first stage shut down two minutes and 29 seconds into the flight after boosting the vehicle to a speed of 1.87 Kilometers per second, departing the stack via four pneumatic pushers that sent the stages on their opposite ways three seconds after MECO. Immediately after staging, the MVac-powered second stage went into start-up mode and ignited its 95,000-Kilogram-force engine on a planned burn of 6 minutes and 18 seconds to directly inject the stack into its target orbit – flying an initial lofted trajectory to climb to the target altitude before pitching down to accelerate to orbital velocity. Fairing 2.0 had its big moment two minutes and 59 seconds into the flight when it dropped away from the climbing rocket and began its trip back toward Earth. At least one half of the fairing featured recovery hardware and was headed for an attempt to maneuver toward the fairing recovery vessel deployed underneath the rocket’s flight path around 510 Kilometers from the launch pad. 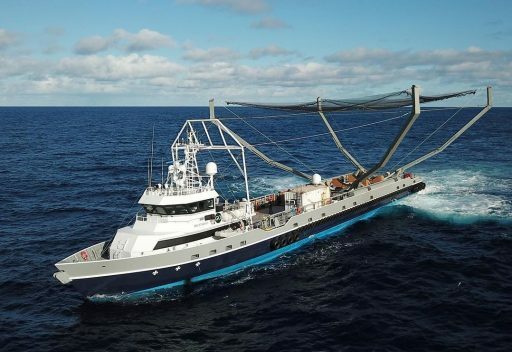 The fairing half pegged for recovery successfully managed to descend from space and deploy its parafoil, but missed Mr. Steven “by a few hundred meters,” according to Elon Musk. Apparently the half splashed down intact and future plans of increasing the size of the chutes may make the feat of catching it easier. Falcon fairing half as seen from our catcher’s mitt in boat form, Mr. Steven. No apparent damage from reentry and splashdown. For the first stage, separation marked the start of a data-gathering exercise on its return regime. 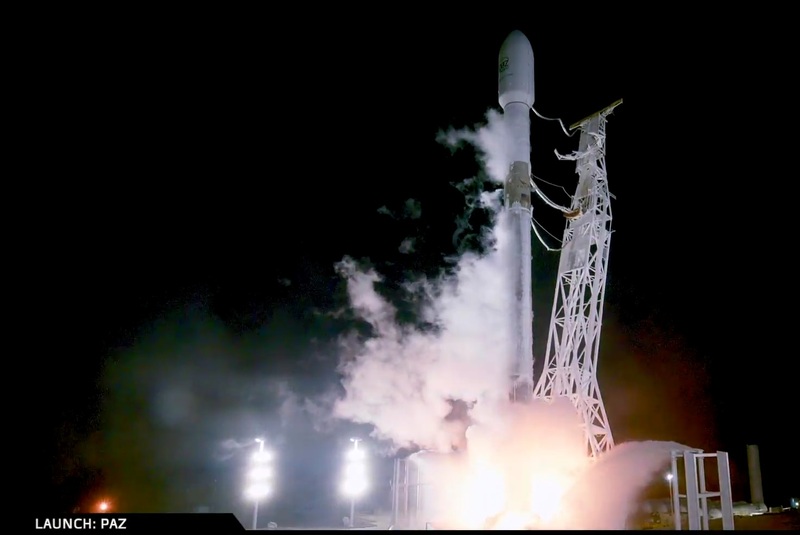 December’s Iridium-4 mission and the GovSat flight in January both disposed their boosters via soft splashdown landings after collecting data on flight environments not possible for operational returns to deliver valuable information for the continued refinement of the booster return sequence. Stage 2 was lightly loaded on Thursday, carrying a total payload upmass of around 2,200 Kilograms whereas the vehicle’s theoretical capacity to the target orbit was 8,600kg with RTLS landing of the first stage and 11,700kg with ASDS recovery. Real time calls made by the launch team indicated Stage 2 performed admirably throughout its burn, spending the last 15 seconds in terminal guidance to ensure an on-target injection of the PAZ satellite and its two companions. Shutdown of the second stage was called right at the T+9-minute mark and the guidance engineers confirmed a good orbit was achieved. The PAZ satellite was sent on its way just after clocks hit T+11 minutes, starting a decade-long mission to deliver high-quality radar imagery and ship-tracking data to the Spanish Government and commercial customers. SpaceX did not cover the separation of the two MicroSats and details on their mission are unlikely to be coming forward given the secrecy with which the project reached the launch pad.